These terrific vintage pink sapphire earrings dazzle with bright white accent diamonds. Horizontally mounted colorful pink sapphires draw your attention to these earrings. Two bright oval pink sapphires are centered among thirty-two small fiery white diamonds. 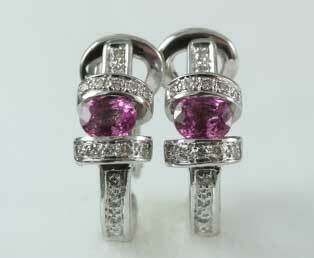 These well-constructed pierced pink sapphire diamond earrings are made in 18kt (750) white gold. These earrings would be great accessory for your wedding dress.